Explore our England surf holiday destinations. The history of surfing in England is a hotly debated subject within the UK surf scene with some saying King Edward brought back the sport after a trip to Hawaii where he allegedly caught a few waves with Duke Kahanamoku on Waikiki Beach in 1920. Others give credit to a batch of young Australian lifeguards who came to Cornwall and proceeded to show off their skills on never seen before glassed Malibu boards, which allowed them to glide across an unbroken wave for 30 metres! Something that wasn’t deemed possible on the wooden plank boards that were being used by everyone prior to this. This group paved the way for the newly formed Surf Life Saving Association to establish clubs of trained volunteers to care for the beach and provide water safety, this developed into paid lifeguards on beaches, often experienced lifeguards from Australia or South Africa, which resulted in them bringing their surfboards. Setting a bench mark for not only lifesaving and first aid, but surfing equipment and skill. The melting pot of waves, local water-users, visiting surfing lifeguards and local board builders allowed the South West of England to develop rapidly growing surf cultures. 1962 saw the first group of surfers come together and ride fiberglass boards on Newquay Beaches such as Fistral and Towan beach, with friendly competition, business and close friendships flourishing because of it, it was around this time that British Surfing Association formed, paving the way for competitive surfing in Britain. New surf spots were discovered, shops popped up, word spread and an industry to build the equipment soon developed. Every nook and cranny of the British Isles that received waves was now recognised as a surfers paradise, if you could withstand the cold temperatures whilst clad head to toe in neoprene. Fast forward today and the surf scene is thriving in the UK, today an estimated 300,000 go in the water annually, with the exact number probably much higher, and with the Gulf Stream running past Devon and Cornwall you can still get waves in the depths of winter, as the water is roughly 4 – 6 Degrees Celsius warmer here than the rest of the UK. What's the surf like in England? England has an incredibly versatile and varied coastline with an abundant amount of beach-breaks, reefs, slabs, point-breaks and river mouths that will appeal to surfers of all abilities. This huge variety of waves is what appeals to people wanting a UK surf holiday, especially when they are prepared for the cold winter weather. Cornwall and Devon offer the most consistent coastlines, although the North East of the UK also receive good consistent waves in the winter months due to the type of reef and dominant offshore winds that prevail. The UK receives the majority of its waves through the low pressure systems in the North Atlantic, which is the most prolific swell generating Ocean on earth. During the Northern Hemisphere winter months massive storms travel thousands of miles across the Atlantic Ocean before arriving on the British Isles, when big wave spots such as The Cribber in Newquay, Porthleven in South Cornwall and Lynmouth in North Devon come to life. North Devon surfing is centred around the Croyde and Woolacombe areas, with a host of spots found around these 2 beachside villages. The villages come to life between April and October with a host of restaurants serving locally sourced food, thatched pubs serving local ales, a bustling retail scene and an abundant amount of surf shops with a thriving holiday crowd mixed in as well. Due to the geology of the area here is a surprising variety found in the waves here, from a-frame peaks found, rocky reefs, point-breaks and even river mouths, this area will appeal to surfers on all levels. The tides here affect the breaks due to their size, so have some options lined up for different breaks during your surf holiday in Devon. The South Devon surf breaks are less consistent than the north coast of Cornwall and Devon, but don’t let that deter you, there are still a large variety of waves to be found here, and with the right swell and wind direction you will find some of the finest reef breaks in the country. The south coast of Devon is a good place to head during the autumn, winter and spring swells when the Atlantic swells come from a more southerly direction, southerly swells from the Bay of Biscay lows can also fire up the area’s diverse breaks. 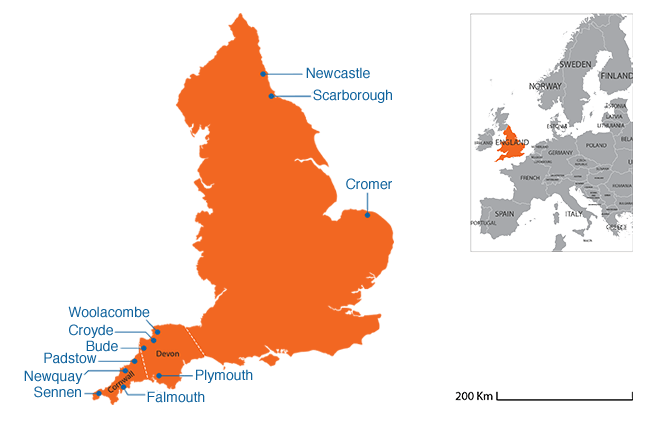 Exeter and Plymouth are a great place to base yourself. They are bustling towns that have something for everyone from ancient pubs to big night clubs and everything in between! Very much the same coastline as North Devon, North Cornwall surf breaks are situated on large portions of protected National Trust land, this has allowed the area to remain untouched from developments which are found in South Devon and Cornwall. When big swells filter in during the winter and blow out all the west facing beaches, North Cornwall’s tiny coves, such as Bossiney Haven and Mother Ivey’s fire up, turning big SW storm swells into wedgey a-frame peaks. The North Cornwall coast is not only home to exceptional surf breaks but unparalleled scenery whilst you surf, from lush green fields merging with the aqua Atlantic waters to imposing granite cliffs towering above you as you surf in North Cornwall. In the far northern part of Cornwall, bordering Devon you will find Bude, this bustling seaside town is the perfect place to head after a surf to grab a hearty and filling Cornish pasty, visit the many shops or grab a swift pint of proper Cornish cider. North Cornwall is also a foodie’s paradise with the historic port town of Padstow serving up delicious locally caught seafood in their many restaurants, it’s also the perfect place for a few drinks in the evening as you watch the last of the fishing trawlers coming in to dock. The surf capital of the UK, Newquay and home to a good variety of England Surf Camps. The most active surf town in England and the UK, Newquay offers everything, great food, great waves and a huge variety of activities to go along with surfing. Home to some of the most famous waves in Cornwall, Fistral and Cribbar, Newquay offers so much for your surf holiday. Much the same as Devon’s south coast, South Cornwall relies on southerly swells to light up its selection of reefs and beach breaks, although a massive westerly swell will wrap round the peninsula producing great waves. The crown jewel in the area is Porthleven, and when conditions line up is arguably England’s finest wave with a perfect right hander breaking across the granite reef bottom, with a shorter left hander. There a variety of fun beach breaks to be found also that stretch from Sennen to Falmouth. For fun in between surfing we suggest heading to Cornwall’s historic port town of Falmouth, here you will find idyllic shops selling beautiful locally made arts and crafts as well as a thriving food scene from delicious vegetarian restaurants to high end cuisine. For a day that seems like you are in the tropics, head to Whitsands. Spend the day surfing the fun beach break waves that roll into the bay, with turquoise hued waters that lap up onto the white sand. As the tide drop backs out, do like the locals and explore the areas rockpools, who knows, you may even find that nights dinner! The east of England offers waves perfect for beginners to experienced, depending on the time of year. Due to its location the breaks rely on North swells that come down from the Arctic, making for waves that average 3-6 foot on the main beaches providing the perfect playground for beginner surfers. When a deep low manages to filter down the North Sea the reefs down here come to life and with the shape of the coastline you will be able to find offshore peaks when the wind blows anywhere between NW – SW. The area around Cromer is recognised as an AONB (Are of Natural Beauty) and is the perfect place to go for day out if the waves are small, with dramatic cliffs giving way to vibrant green pastures and historic buildings. Head to the city of Norwich and walk the cobbled streets learning about the city’s ancient history and head to the city’s many public gardens and parks. The North East coast is quickly becoming well known amongst surfing circles for producing some of the best waves in England from long reeling point breaks, river mouths, hollow beach breaks and unforgiving slabs of reefs that should only be tackled by experienced surfers. The geology of the coastline allows for you to explore some of your own waves and when a deep Arctic low comes down and meets with the UK’s dominant SW wind, the results can be perfect head high waves all to yourself when the rest of the UK is flat! A great alternative to head to for a different surfing experience compared to the busier Devon and Cornwall surf spots. Just remember the water is colder here! Scarborough and further north Newcastle both have many waves littered around and are also bustling areas. Newcastle is an English city full of retail shopping, theatre, live music, exquisite food and lively nightlife and Geordie’s are some of the friendliest people you can meet in England. It’s surfing in England so don’t expect too much with the weather, over half the days of the year are overcast with the weather in Devon and Cornwall changing in the blink of an eye. Luckily for Devon and Cornwall the Gulf Stream runs up past the counties making the water a lot warmer than the rest of the UK, you may even get some great longboard waves in 26°C sunshine. A 3/2 is perfect for the summer months with water reaching 19°C in the height of the summer, and after a long flat spell the water can get even warmer, so you may even be able to go for a surf in a shorty or long john. Winter sees the water temperature drop to 10°C meaning a 5/4, gloves, boots and even a hood for those extra windy days are essential, especially when a chilly NE wind blows. Be prepared to wear a winter suit for at least 6 months of the year. The East Coast is a lot colder with water temperatures dipping to 5-7°C in winter, so you will be looking to wear a 6/5/4 with 5mm gloves, boots and hood. With its geology the NE weather can get extremely cold in winter when the best swells come in, so don’t be surprised to trudge through a sprinkling of snow on your way to the line up!